San Francisco is one of the US cities known for having one of the highest cost of living in the country, with accommodation being the highest contributor to cost of living in the city. As of 2015, it is said that San Francisco's cost of living is 62.6% higher than the average cost of living in the US. Expatriates who find themselves in this city are usually doctors, nurses or IT professionals who enjoy attractive remuneration packages. Due to the geographical makeup of the city where the area is concentrated in a limited city centre, little room has been left for individual houses which are most expensive and hardest to find. A more affordable option comes in one or two-bedroom apartments which cost anywhere from $2,630 to $3,350 a month. For singles or smaller households, one can get a studio apartment for at least $2500. The margin between the upper and lower scale houses in San Francisco is widening, and while both are expected to be on an uptrend, the current median price for a two-bedroom Bay Area home is from $1,100,000 to $1,750,000. The most expensive neighbourhoods in San Francisco include Russian Hill, Marina, Pacific Heights, Nob Hill, Mission Bay, Noe Valley, South Beach and South of Market where houses can cost up to $1,400,000, while the cheapest areas can be found around Sunset District, Bayview and Visitation Valley. Due to differences and overlaps between state and federal real estate laws, it is important for an expatriate to consult a local real estate agent in San Francisco before buying any properties to prevent legal complications. Utility costs in San Francisco consist of phone, internet, water, electricity, cable and natural gas consumptions. A landline costs about $40 a month, provided it is not used for long-distance calls, while a DSL connection can run about $55 per month or around $8 per week. Cable will cost about $15 per week while the two major utilities, electricity, water and gas, can get quite costly, especially during the hotter months and can run up to $120 a month. San Francisco is known for its multinational cuisine from Chinese to Western and also for its high-end restaurant prices. A three-course meal that includes an appetiser, main course and desert can cost anywhere from $25 - 100 plus per head while those who cook at home spend much less with an average monthly food budget of about $200 - 300 a week. The San Francisco Municipal Railroad or MUNI is the city's main public transit system where a basic fare of $2.25 covers about a 90-minute ride. The public transport ticket for one month costs about $90. Weekly passes are good for $20 with a $1 surcharge for a ride on the cable car. 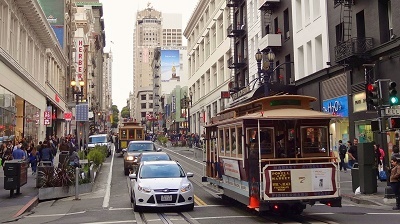 As a global city, San Francisco is recognised for its linkages that bear direct and significant socio-economic influences on the international community. For this reason and more, people understand why the cost of life in the city is nothing ordinary.